South Florida Clean Energy Network’s leaders in Ft. Lauderdale, including representatives of 1SkyFL, Greenpeace, and Oceana, organized "Greenfest" on Fort Lauderdale Beach on 10/10/10. TV reporters showed up as 60 cyclists rode in from the local Critical Mass group, Food Not Bombs showed up with vegan food for the crowd, activists clean up trash, speakers from various organizations engaged the crowd to work for more change. Speakers included 1Sky Climate Precinct Captain, Maria Rotunda, who urged attendees to not only change their light bulbs and alter lifestyles, but to also work for political action that will create the massive changes across society. The evening wrapped up with a candlelight vigil of candles shaped in a 350 formation- signifying the 350 parts per million of carbon which is the appropriate level of carbon dioxide in the atmosphere (which was surpassed in 1986). Today’s levels are at about 390 and climbing by 2 ppm each year. 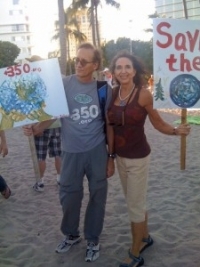 1SkyFL also helped to coordinate many volunteers at a rally in Miami for the 10/10/10 global work parties to stop climate change (see video below). Organizers and volunteers from 1SkyFL, Greenpeace, Oceana, and Sierra Club collaborated to promote and recruit citizen participation in the event, as well as attention from TV and newspaper reporters from CBS, NBC, and The Examiner. 1Sky promoted a bike ride to the event from the downtown area over the Venetian causeway with the help of Emerge Miami and South Florida Bike Coalition, to encourage citizens to arrive at the event emissions-free. Once arrived, cyclists cooled off in the water on a hot day. All participants gathered to create a formation of the number 10/10/10 for a photo. Here’s the video -- compiled by Juan Carlos Gallo. In the end, will these individual and community actions lead to real and needed policy actions in our country and around the world? Christiana Figueres, the new Executive Secretary of the UNFCCC, endorsed 10.10.10 and encouraged participation in the mass civil society action in advance noting it could encourage governments to move more aggressively. You can watch the video of her statement prior to an international climate policy gathering in Tianjin, China last week. While the U.S. Senate ducks its responsibility to take action and international negotiations crawl slowly along, Figueres’ statement is some proof that our voices and our concerns are, at least, being heard.